Bake, Serve, Freeze, Store and Reheat – all in the same Baker, with this Basic Essentials 5 Piece Stoneware Baker Set. 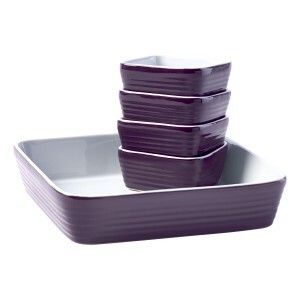 This Basic Essentials® (be®) 5 Piece Baker Set is one simple and smart solution to your baking and entertaining needs. It includes one 9 x 9 x 2 inch vitrified stoneware baker, and four 3.75 x 3.75 x 1.75 inch vitrified stoneware mini bakers. These vitrified stoneware bakers are perfect for oven to table service. You can bake, serve, freeze, store and reheat – all in the same baker. Vitrified stoneware is fired at high temperatures to create a durable bakeware that withstands everyday use. It is energy efficient, conducts heat equally, bakes evenly, retains heat excellently, and is easy to clean. Vitrified stoneware is resistant to moisture, oils and odors, and never imparts unwanted flavors to foods. It is also dishwasher, freezer and oven safe, microwaveable, and meets or exceeds Prop 65 and FDA standards with your health in mind. What’s more, the four mini bakers store in the large baker for space efficiency.